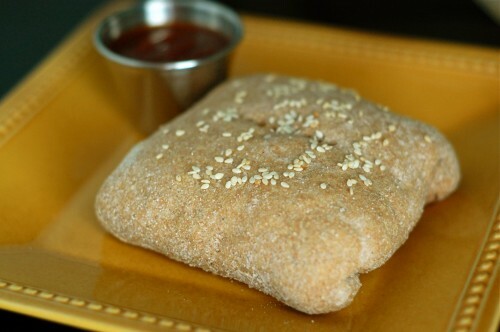 Get ready to add a new favorite dinner to your weekly rotation…whole-wheat pizza pockets! These are sure to please eaters of all ages and the best part is you can use up food or leftovers from your fridge for the fillings. Little ones might especially enjoy making their own pizza pocket so don’t be afraid to get them involved. Their friends might like to help as well so for the next sleepover or birthday gathering consider hosting a “make your own pizza pocket” party. And if you have time to double the recipe these are great leftover the next day or even weeks later if stored in the freezer. In a glass measuring cup heat 1-cup water until warm. Drop in 2 teaspoons yeast and let rest for a minute. After the yeast foams up a bit add the salt and olive oil to the water mixture and gently stir if necessary. In a food processor or mixer with a dough blade/hook add 3 cups flour. Pour in the water mixture and process until a dough ball forms. Coat a large bowl with olive oil, add the pizza dough ball, and cover with plastic wrap while you prepare the other fillings. In another bowl mix together the ricotta, mozzarella, and Parmesan. Chop and/or cook other desired fillings while dough rises on the counter (20 – 30 minutes). 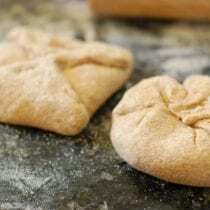 Alternatively you can make the dough earlier in the day and let it rise in the fridge or if you are short on time it will still work if you don't let it rise at all! Divide dough into 6 equal sized pieces. Shape each one into a ball and then flatten it out with a rolling pin. Don’t roll it too thin (see picture for recommended size). Spread a spoonful of pizza sauce in the center of the dough. Add two heaping spoonfuls of the cheese mixture and one spoonful of filling (or 3 spoonfuls of cheese mixture if no other filling is desired). Seal edges of the dough together as best you can with your fingers (see photo for two examples) and flip it over so seam side is down on a greased baking sheet. Make a couple of holes with a fork in the top (to prevent the cheese from leaking out the bottoms/sides) and top with raw sesame seeds if desired. Bake in the oven for 12 – 15 minutes and once done let cool for a few minutes. Serve with warm pizza sauce for dipping and enjoy! 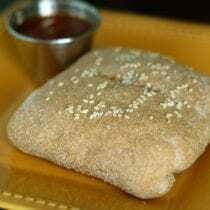 I am looking for a yeast free dough recipe for something like this, wondering if anyone has something? 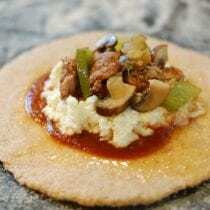 Right now I use Pillsbury roll out pizza dough or cresent rolls and I want to get away from all the processed stuff. My family loves the taste of whole wheat flour. These look great, but I can’t put yeast in them as my kid and husband have yeast allergies. Let us know if you experiment. If you’re popping these in the freezer, at which step would you do it? Pre-cooked, post-cooked, or even risk a part-cooked? Sorry if this has already been asked!